I had my first appointment with my psychologist today. She will be helping me with my problems with food. I don't know how she plans to do it but I hope it works. It was my first time. I thought she would have a couch and I would lie there and talk and talk... but not. She was sitting in her chair behind a desk and I was in the other side... just like a normal doctor. And she just filled a questionnaire. I think it will be different in the next sessions. It was weird talking to a total stranger about my issues...but also a relief. I've been looking for the (almost) perfect easel all my life and I finally found it!!! You see, I work in the most awkward positions... and I'm always using my left hand to hold the painting I'm working on but I get tired, or I slip and I make a mistake. I think the one who invented this paints like me.. so he (or she) would need something that moves around, not just swivels back and forth. This thing can be positioned in several ways... I'm so happy with it! For the ones who have asked... you can get it here. Your painting seems beautiful already, and so big! Good for you Danita!! I think it is wonderful to get that kind of help:) wishing you all the best with it!!! Love your new easel...I work the same way and I'm turning into a hunchback!!!! hey sweetie pie danita! good for you! it takes a strong person to do what you are doing! you are brave & i support you! GO YOU!!! 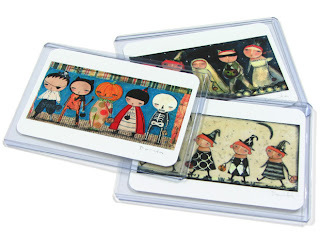 your aceo sets are adorable! 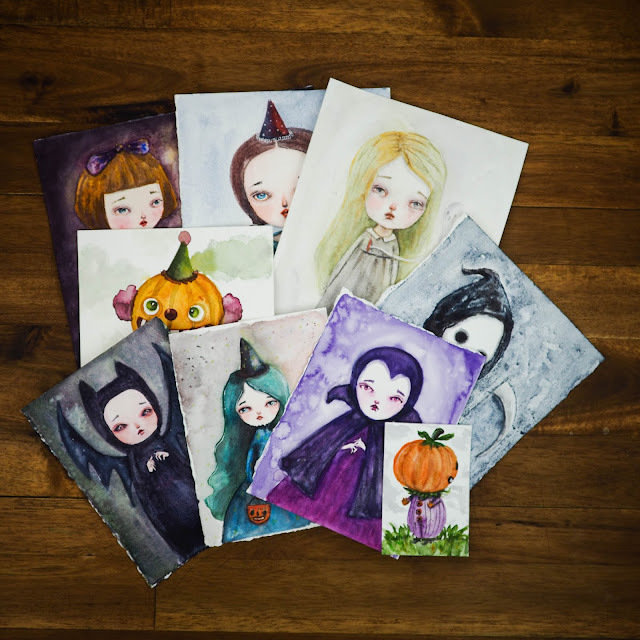 I think I will just sell the rest of my halloween art & get going on Christmas! p.s. 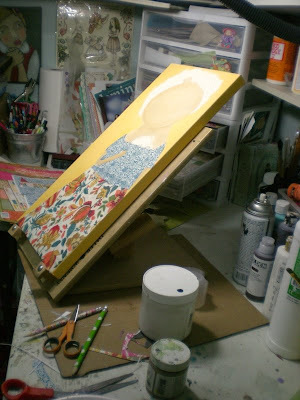 love the piece on ur easel! Congratulations on your weight loss. Love the easel. Your Atc's are wonderful. Hi Danita! OK, I jave a few things to write you about...I am reading a book called "The Crazy Makers` How tht Food Industry is Destroying Our Brains and Harming Our Children"...and when I get done I am going to be SURE to blog about it and maybe even buy everyone I know a copy for Christmas (want your Chistmas present early?...no, really?). The other thing is, LOVE your easle...gotta get me one because my neck hurts all the time now...even in my sleep sometimes. I am listing a painting tonight and I knew way before I was finished what I wanted to call it...but I want to say it in Spanish and thought maybe you'd help. It is a saint with a bowl of fruit and I want it to be called something like Sant de Las Frutas...does that make sense or am I just a dumb American? Wow! I never write this much in the comment section of a blog. I'm so excited to feature you next week! The new boxes are absoluetly to die for! I would love one of those easels! Not that I paint all that much, but when I do, I'm weird like you. I am all over the place. Just remember- nothing tastes as good as slendar feels. I am very glad that everything went well with your surgery, I had also problems with weight in the past and I know how hard it can be. For me painting and creating has been the best therapy. Also going for a walk helps. 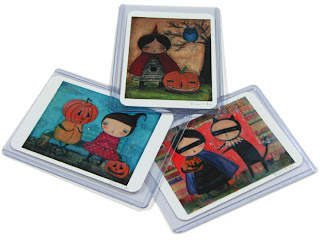 Love the Halloween ACEOs and the new easel. Pretty cool! Thanks for the link to this easel, best of luck for the psychological help, truly! 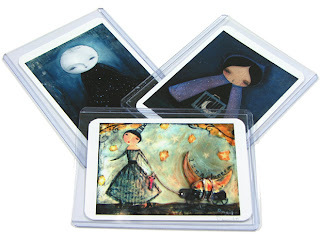 And I was browsing through your aceos in your shop earlier this evening. Lovely! Hi Danita! I'm one of your new friends from Charming Exchange! I also had serious eating problems. For me, I finally had gastric bypass surgery summer of 2007 and I have lost 93 pounds! I'm almost done! I'm sending you best wishes on your journey!! I have a blog called the Fat Files...A Fat Chicks Journey! I'm published in BELLE ARMOIRE !!!! I'm fitting into my pre-pregnancy jeans! Visit to the pumpking patch!